If you strongly desire to become a driving instructor or run your own driving instruction business, then the driving instructor certification program from Brainmeasures is highly recommended for you. The driving instructor course offered by Brainmeasures is one of the best online certification courses at present because it works in providing information about the basics of teaching others how to drive in the safest way possible without violating any rule. The program comes with a high quality and comprehensive driver instructor training which is effective in demonstrating and explaining some of the most useful driving techniques that you can teach to your students as well as the technical aspects of a vehicle and its primary mechanical operations. With the help of the driving instructor certification course offered by Brainmeasures, you will be able to improve not only your teaching skills but also your ability to assess the driving performance of your students, provide them with feedbacks and offer information about the things that they can do to further refine their driving ability. 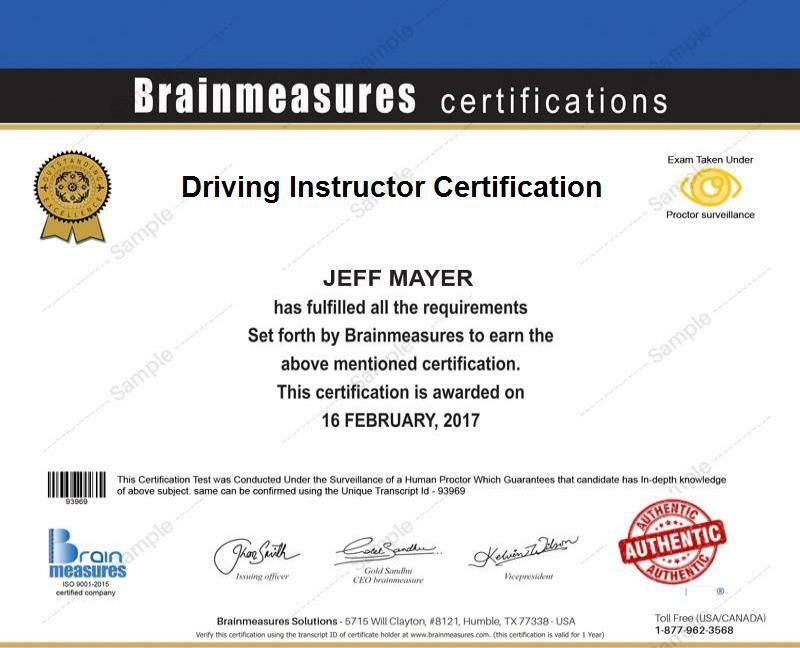 Note, however, that you won’t be able to receive your certificate in this field if you don’t take and pass the online driving exam which is a huge part of this certification course offered by Brainmeasures so you have to make sure that you take the learning process seriously. Anyone who is greatly interested about honing their skills in safe driving can enroll in the driving instructor certification program from Brainmeasures. This is suitable enough for you if you are aiming to become a driver instructor and you want to make sure that you will be able to perform all your responsibilities in this type of profession in the most efficient manner possible. This is also a good choice for those who are greatly interested about opening up their own driving school or business. As a driving instructor certification holder, you can expect your salary to become more than stable. This is especially true if you have decided to open up your own driving school or business. If you plan to work for others, then you should be aware that your earnings can either be on a fixed or hourly basis. If you work on a fixed contract, your average annual salary would be around $56,000. If you work on an hourly basis, then you can charge your clients/students anywhere from $10 to $25 per hour.